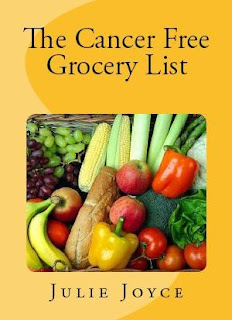 Flip Out Mama: Cancer Free Grocery List e-book by Julie Joyce! Today I have a great ebook download to tell you guys about. The book is called "The Cancer Free Grocery List" and it is written by Julie Joyce. Julie is the Executive Producer and host of Cancer Free Radio and her mission is to help families lower the risk of cancer in their families. Did you know that one in three people will get cancer? ONE in THREE?? Those are crazy numbers! This book helps you to fight those odds by helping you choose foods that can help fight off cancer and help you to be the healthiest that you can be! This book is a great resource for anyone who is concerned about their family and their health! And, the best part of all? This book download is priced at only $.99! Who doesn't love that!? If you would like to check out this book, you can do that here!